When it rains, it pours. We haven't had a light hearted Theme Hospital-like simulation in many years, and now we have two announced within a few months of one another. Late last year Project Hospital caught our attention, and now SEGA and Two Point Studios have announced Two Point Hospital. With a highly amusing trailer to boot. Two Point Hospital, inspired by and from the creators of Theme Hospital, is set to be a return to one of gaming's most loved sim genres. 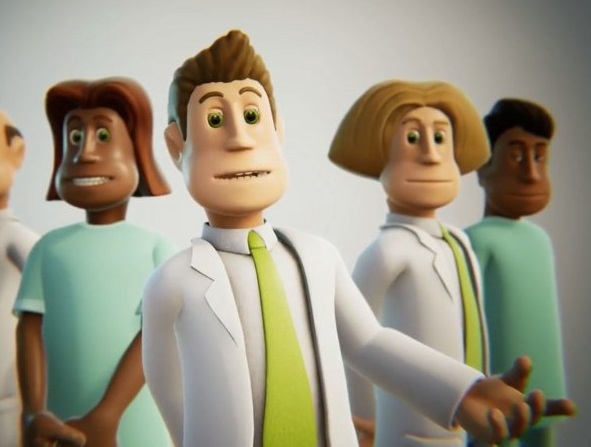 Two Point Hospital draws on the experience of some the gaming industry's most experienced and successful sim developers, who between them, in addition to Theme Hospital, have worked on titles like Black and White, Theme Park and Fable at studios including Bullfrog, Lionhead and Mucky Foot. Two Point Hospital will deliver a compelling experience packed with the humour, charm and replayability fans of the genre have come to expect. While the trailer doesn't contain much gameplay, we can see that it has a very appealing, bright aesthetic, and the tiny snippets that we did are tantalising - it looks like all the research and development, and business management of the hospital will be there. To go with the patients that have had their heads turn into light bulbs. The game has been announced as PC-only for now, but will be available later this year - no firm release date just yet either.